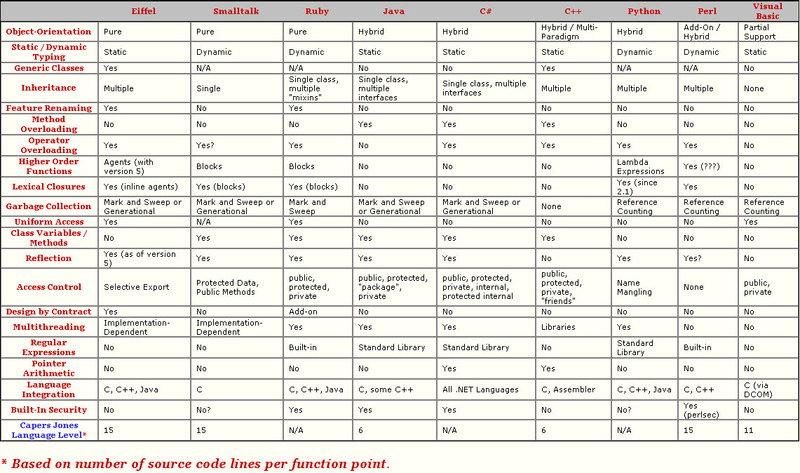 Everyone is curious to compare the different programming language, so I am. I browse different articles and website to have clear vision about the difference. Every programming language has their own specialty. Just the difference between the top language and other language is how much they give facility to the programmer how it is fulfilling demand of the market. And after knowing these specialties of, obviously we would like to compare the position of these languages. This information I found from http://www.ohloh.net. You may compare your interested language from the given site. After all, I have found the C# and Java to be the most demanding programming language of current market. And both the language are relatively same. To compare these languages, you may visit http://www.javacamp.org/javavscsharp/index.html . We may compare different functions, keywords events, operators etc. comments, but I felt really compelled to this time. I shared this on my facebook and bookmarked your blog!